Ploughing, seed bed preparation and planting. 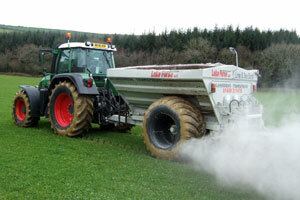 Umbilical slurry pumping and muck spreading. 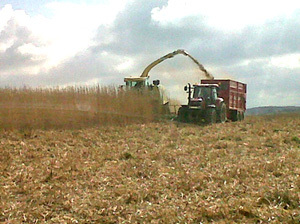 Grass, maize and wholecrop harvesting. 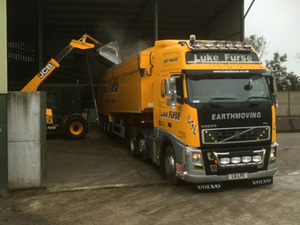 Corn drying, grain storage and haulage. If you require any services not listed above please contact us. We offer free no-obligation quotations. We grow a large quantity of cereal crops each year including organic oats for human consumption, common oats, wheat and barley. 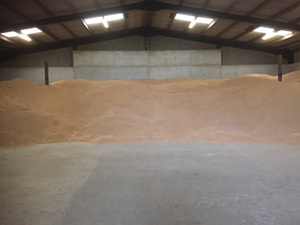 These crops are stored in our new CMI-certified grain store and delivered throughout the South West with our own articulated transport fleet. The straw is baled and delivered to local farmers. We grow forage maize and organic crops on contract for local farmers. Cleaning records of combine harvesters are available when changing from non-organic to organic crops. 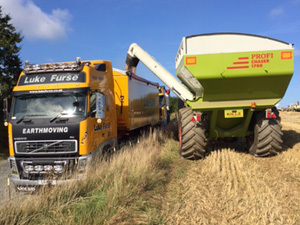 The crop of Miscanthus in the picture below was harvested by Luke Furse Contractors on 7th April 2012 using a 12 row easy collect header. This can be used for heating or bedding. The crop yielded 4T to the acre. Miscanthus grows year upon year with no inputs and is a very profitable form of income for farmers. Yields well in heavy clay land. A crop that lasts for 20 years plus. Little attention apart from weed control. Grants available from Natural England. We supply top quality Round and Square Bale Haylage, Hay, Wheat, Barley and Oat Straw. Umbilical slurry pumping up to a distance of 1.5 miles. A fleet of up to 20 4WD tractors with implements covering all seasons. 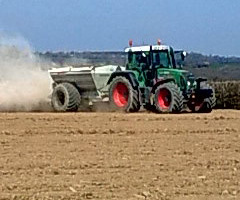 Lime and sea sand form a large part of our tillage programme. 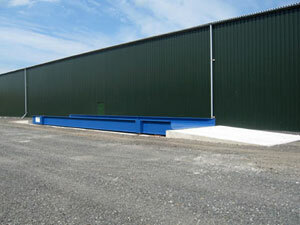 We supply and spread large tonnages throughout the season. pH testing is carried out in-house providing recommendations for application rates to customers. With minimal ground pressure and outstanding traction the Claas Lexion 410 is a light combine with each track having a footprint 2.1m long by 770mm wide with a transport width of only 3m. 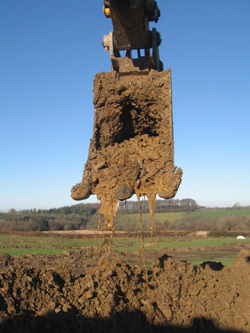 This avoids soil compaction and damage to fields. Your crops can be harvested in these difficult times – "keep on tracking". 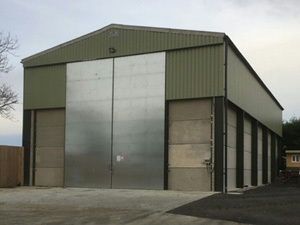 Our new high capacity grain drying facility has proved very successful with most crops having to be dried these days. This means we can combine and dry your grain in the same day from our CMI Grainstore working with our 15m Public Weighbridge. 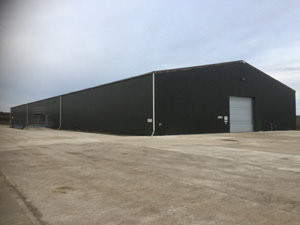 15000 tonne GTAS approved flat store available. Now storing grain for some of the largest grain distributors. Grain cleaning and rolling service. Your grain can be delivered back to farm. 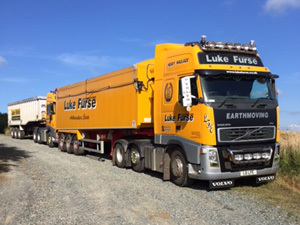 Artic grain haulage with task assured trailers also available. Providing a professional service for our customers – "keeping it cool". 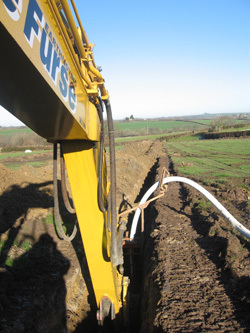 Deep land drainage forms a large part of winter maintenance work on agricultural farmland. A trench 2 feet wide and up to 8 feet deep with our purpose built automatic pipe layer running in the trench laying perforated pipe from 60mm up to 160mm. The pipe layer protects the pipe at all times. Also preventing personnel entering the trench at any time. Land water is generally found between the clay and shale layers. Trenches are backfilled on completion, after the trenches have sunk. Drains are levelled off prior to ploughing and reseeding. Outfall pipes are installed and drainage record plans are drawn for future reference. Ditch cleaning and hedge rebuilding are also part of the service. This newly installed 15 metre Weighbridge with state of the art technology will weigh a fully loaded articulated lorry complete with trailer. A digital print out system is electronically operated. Weigh cells ensure accurate and precise weighing. This model, Westco Titan, is the largest model currently in production.